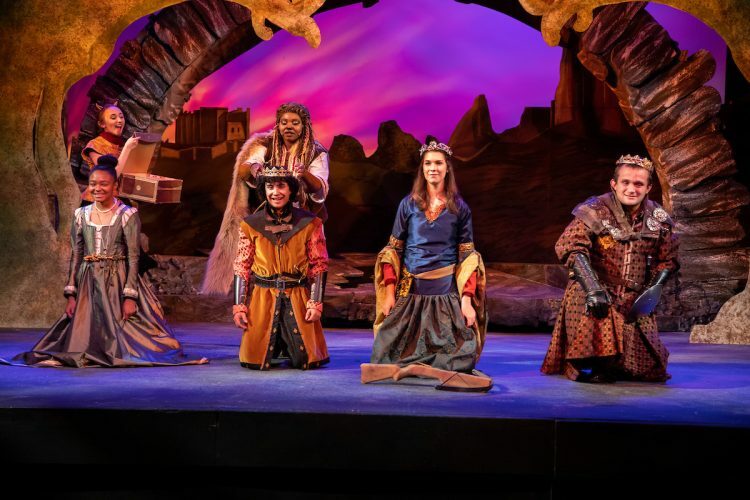 Liz Beamon ’20 (second from left, standing) and Ho’ola Bush ’20 (second from left, kneeling) were nominated for Irene Ryan Acting Awards for their roles in The Lion, the Witch, and the Wardrobe. Four Randolph students were nominated for awards at the Kennedy Center American College Theater Festival (KCACTF) for their roles in the fall theatre production, The Lion, the Witch, and the Wardrobe. Liz Beamon ’20 (Aslan) and Ho’ola Bush ’20 (Edmund) were nominated for Irene Ryan Acting Awards, Chloe Brazzi ’21 was recognized as a props master, and Sarah Wardlow ’20 was nominated as a stage management fellowship candidate. The students were all nominated by a respondent from the festival, who attended the show at Randolph. At the festival, which will be held Feb. 5-9, the students will participate in scholarship auditions and other competitive events in their respective categories. Randolph is part of Region 4, which includes colleges and universities from Alabama, Georgia, Florida, Kentucky, Mississippi, North Carolina, South Carolina, Tennessee, and Southern Virginia. Started in 1969 by Roger L. Stevens, the Kennedy Center’s founding chairman, the KCACTF is a national theater program involving 18,000 students from colleges and universities nationwide which has served as a catalyst in improving the quality of college theater in the United States. The KCACTF has grown into a network of more than 600 academic institutions throughout the country, where theatre departments and student artists showcase their work and receive outside assessment by KCACTF respondents.